And what those past investigations tell us about where the Russia investigation might go next. It’s a big day for Robert Mueller and his team: One year ago today, Mueller was appointed to lead the special counsel investigation into possible ties between the 2016 Trump campaign and Russian officials. It’s a miracle, in some ways, that Mueller has lasted this long. President Trump’s relationship with the investigation has grown increasingly adversarial, and at many moments over the course of the past 12 months, it seemed like Mueller’s job was in jeopardy. But the total number of charges doesn’t tell the whole story. 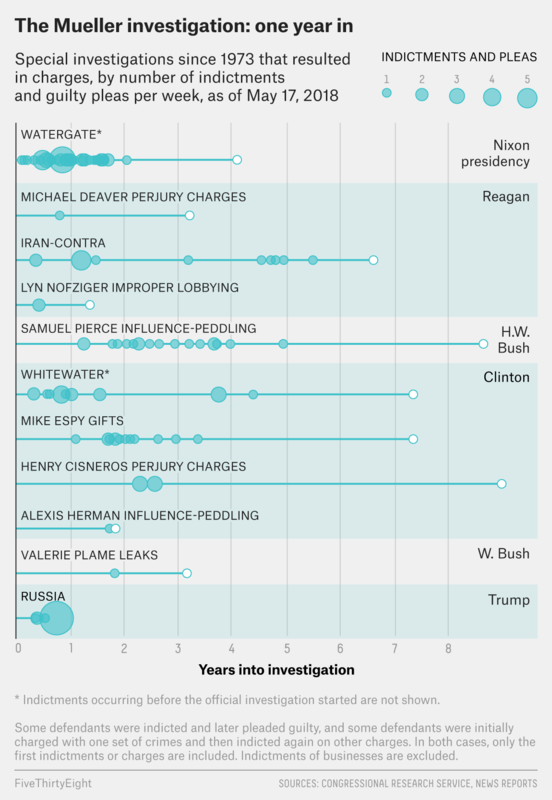 To get a sense of where Mueller’s investigation might go in its second year, it’s worth looking at where the three other highest-profile investigations in modern history — Watergate, Iran-Contra and Whitewater — stood a year after a special or independent counsel came on board and how they evolved in the year or two afterward. These investigations give us three separate models of what Mueller’s first year could mean for the rest of his investigation, and they show how foolish it can be to predict the end of a special counsel investigation based on its beginning. Watergate lived up to the dramatic promise of its first year: It ended Nixon’s presidency and sent dozens of people to jail. The revelations in the Iran-Contra scandal initially seemed like they might engulf Ronald Reagan, but the scandal began to fizzle when it became clear that Reagan wouldn’t be implicated. And Whitewater, which was sleepy at first, eventually resulted in the impeachment of Bill Clinton — but for reasons that could never have been foreseen after the first year of the investigation. The year after Archibald Cox was named special prosecutor in the Watergate investigation was, to put it mildly, a whirlwind. That’s partially because Cox was stepping into a scandal that had already been unfolding for months. The Watergate break-in occurred in June 1972, and by the time Cox was named special prosecutor in May 1973, the trials of the Watergate burglars were already complete. At this point, the stakes of the investigation were clear: According to a Gallup poll from the month Cox was appointed, 78 percent of Americans said that Watergate was of “great” or “some” importance for the nation. For comparison, in April 2017 — a month before Mueller came on board — Quinnipiac University found that 66 percent of registered voters believed that alleged Russian interference in the 2016 election was either a very or somewhat important issue. A year after Cox’s appointment, in May 1974, Cox had been fired by Nixon and replaced by another special prosecutor, and it was clear that a wide range of people connected to the Nixon administration had committed crimes far beyond the Watergate break-in, including illegal campaign donations, other burglaries, tax fraud and corruption. Nixon also fortified perceptions of his own guilt during this time by dismissing Cox for trying to obtain tapes from his secret White House recording system and continuing to fight Cox’s successor, Leon Jaworski, over the tapes. In other words: If the Russia investigation is truly like Watergate, Mueller’s team may already have the evidence it needs to topple the Trump presidency, and we just don’t know about it yet. It’s also possible that the Mueller investigation will end up looking more like another high-profile investigation: the Iran-Contra affair. During the year after Lawrence Walsh was appointed independent counsel for the Iran-Contra investigation, he secured only two guilty pleas. But the scandal — which involved the Reagan administration’s illegal sales of arms to Iran and funneling of the profits to right-wing “Contras” battling the socialist government in Nicaragua — threatened Ronald Reagan at the height of his popularity. As Reagan administration officials testified before Congress about their participation in the arms deal, it seemed possible that the scandal would engulf the president. Reagan’s approval ratings had plummeted in November 1986, when news about the Iran-Contra affair broke, and they remained low throughout 1987. Meanwhile, in February 1987, 81 percent of Americans agreed that the Iran-Contra scandal was of “great” or “some” importance for the country. By the end of 1987, it seemed clear that more indictments were coming, and Walsh charged six more people — including Reagan administration officials Oliver North and John Poindexter — in the first half of 1988. But unlike in Watergate, the trajectory of the investigation was far less dramatic than the prevailing opinions of the first year would suggest. The convictions of North and Poindexter were overturned, and Walsh was ultimately foiled in his efforts to prosecute a second round of officials for their role in a cover-up of the deal after George H.W. Bush pardoned them a month before he left office. And perhaps most importantly, Reagan himself was never implicated. “Reagan was able to recover and salvage his legacy,” said Richard Arenberg, who worked on the Senate committee investigating Iran-Contra and now teaches at Brown University. It’s possible that the Mueller investigation could turn out to be just as anticlimactic, and Trump — like Reagan — could emerge pretty much unscathed. Then there’s the possibility that the events of Mueller’s first year might not matter much — but his investigation could still end up implicating the president. That’s what happened in the Whitewater independent counsel investigation, which began in 1994 and initially centered on a land deal made by Bill and Hillary Clinton in the late 1970s, when he was still the attorney general of Arkansas. The independent counsel for that investigation, Kenneth Starr, obtained a handful of high-profile indictments in his first year, including of the former governor of Arkansas.2 But Americans were divided on the investigation’s importance at the time — an August 1994 poll showed that 52 percent of Americans thought the investigation was unimportant. It didn’t appear to threaten the president until several years later, when Starr expanded his investigation to include a sexual harassment lawsuit filed against Clinton by a former Arkansas state employee named Paula Jones. It was in a deposition for the Jones suit that Clinton lied under oath about his relationship with Monica Lewinsky, setting up the perjury prosecution that led to his impeachment. As the Russia investigation enters its second year, the most important variable may be how long Mueller can keep his job. Watergate, Iran-Contra and Whitewater all had one thing in common: They lasted at least four years. Given the reports that Trump has already twice considered ordering Mueller’s removal, it’s not clear that the investigation can survive that long — at least, with Mueller at the helm. Looking at past special counsel probes also highlights the limits of what Mueller can do on his own. Cox, for example, benefited enormously from the concurrent Watergate hearings held in Congress, which was where the White House deputy chief of staff revealed that Nixon had a secret White House taping system. Mueller hasn’t gotten similar assistance from this Congress. Three Russian organizations were also indicted. We did not include businesses in our analysis of previous investigations. Robert Fiske was initially appointed special counsel in the Whitewater investigation by Clinton’s attorney general, Janet Reno. But he was ousted in August 1994 after the independent counsel law, which had lapsed in 1992, was reauthorized.